Have you ever had a moment like this? You see new things when you travel. You feel invigorated. Your senses are heightened and suddenly you are engaged in life in a completely new way. 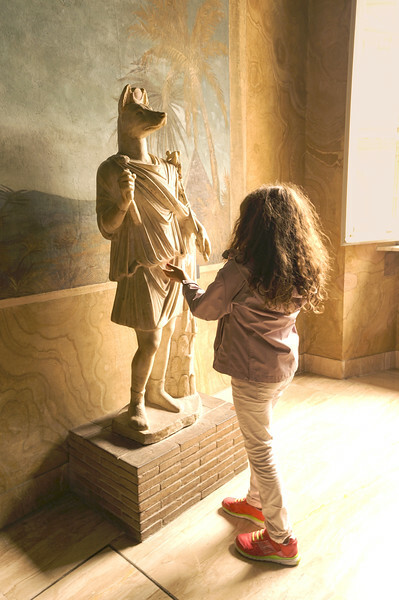 This moment was captured at the Vatican Museum in Rome. As we walked through the Egyptian Rooms taking in the exhibits. we came upon this statue of Anubus and a young museum goer who seemed intent on having a personal, one-on-one conversation with this ancient god. Something about this exhibit spoke to her and gave us this perfect reflection on the power of photography and travel. When combined and curated, magic can happen. We can see and experience things things take us to new places and preserve special moments in time. My name is Clinton Richardson and TREKPIC is my photo gallery. I am all about capturing special moments in time and place. I bring decades of experience to the task. As a boy, I took and developed black and white photos using a 35 mm camera and a dark room crammed into a small unfinished basement. Since then, I have taken hundreds of thousands of images. Now, after classroom and field work with some fine professional photographers and with the time to travel, I am proud to share with you galleries of some of my favorite images. For more about Mr. Richardson click here.